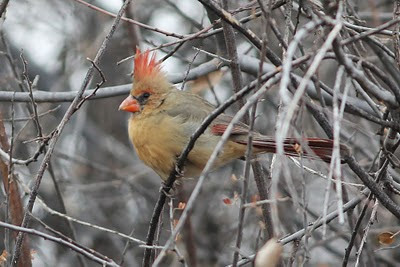 I had the pleasure of volunteering for my first CBC - a Christmas Bird Count, on December 31, 2010. 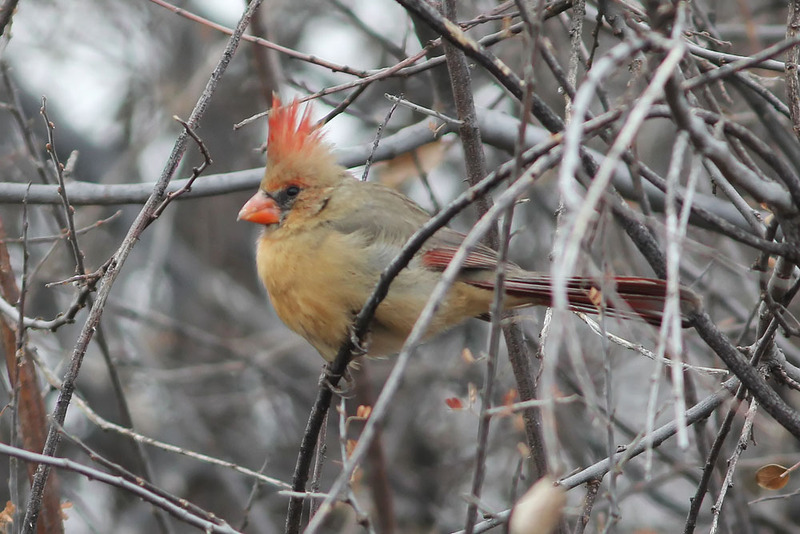 CBCs, for those unaware, are organized efforts around Christmas (anytime between mid December and early January) in which volunteers and experts perform a census of birds in pre-defined areas. These efforts are coordinated/associated with the National Audubon Society (though you need not be a member to participate). The intent is to have a consistent measure of birds from year to year so that trends and status can be identified over time. CBCs are defined by a "circle" - a diameter of 15 miles. Circles are subdivided into regions, and ideally a team is assigned to each region every year. This year I volunteered for the Atascosa Highlands CBC, located in some prime habitat just east of I-19 and along and north of the Mexico border in Arizona. This is some of the wildest land in Arizona, hilly, rocky, and mountainous. Few roads traverse the area, and many are rocky high-clearance vehicle only. 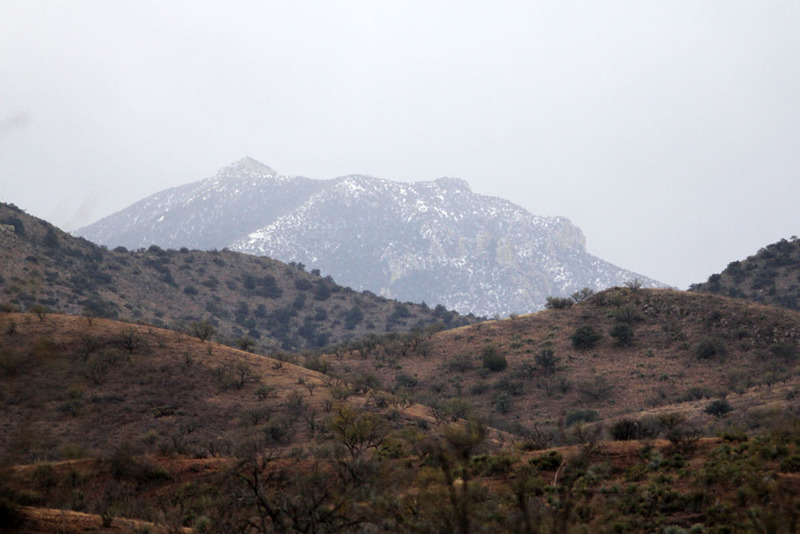 Southeast Arizona is world renowned for its biological diversity due to the confluence of two deserts, pine-oak forests, riparian "magnets", "sky islands", and proximity to Mexico. The Atascosa CBC takes advantage of this, and is centered in some less publicized but prime Arizona habitat. With elevations ranging from about 3500 to 6300 feet, it includes high desert, desert grassland, pine-oak, riparian, and lake habitat, among others. To give another idea of the remoteness and habitat, this is where the Jaguar Macho B was known to roam. Macho B, one of the only known Jaguars in the USA, was famously captured and collared in early 2009, only to die a short time later amid controversy. Of course, weather (that on the day of the count, and that of the past breeding seasons) play a major roll in what is seen year to year. This year was no exception. A pretty good monsoon season resulted in a good crop of berries on the junipers and hawthorns, and weather had been fairly mild. But the two days prior to the CBC a very cold and snowy storm system moved in. The higher elevations of the CBC had a few inches of new snow, and the day of the count saw flurries and snow showers, and generally cold, cloudy conditions. None-the-less, my partner for our CBC area (Dave Powell) and I were prepared and ready to do our best in the Jalisco and Apache Canyon areas. Right out of the gate we came across a nice loose/mixed flock of birds, including this Gray Flycatcher, Empidonax wrightii. Empids can be notoriously difficult to identify. 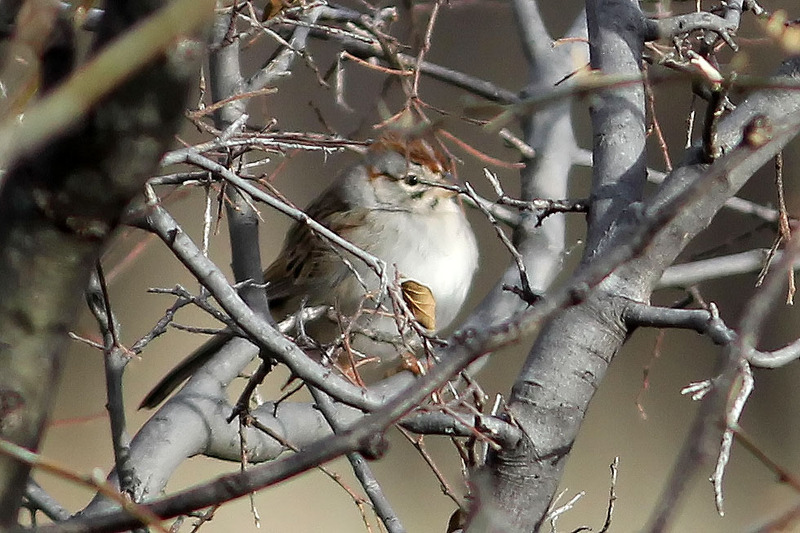 In SE Arizona, very few species typically over winter, but Gray, Hammond's, and Dusky all do, and are all similar. Without a lot of experience, simply looking at the visual features of these birds is generally inconclusive. The differences are so minimal that you'd really need them side by side to see the difference. 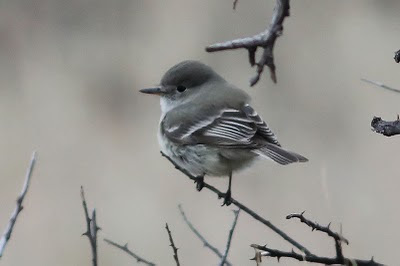 Luckily, the Gray Flycatcher has an interesting diagnostic behavior - it wags its tail slowly similar to a Phoebe. We ended up seeing several of these during the day, and that behavior is now burned in to my brain. Unfortunately, none decided to pose for a close up photo. 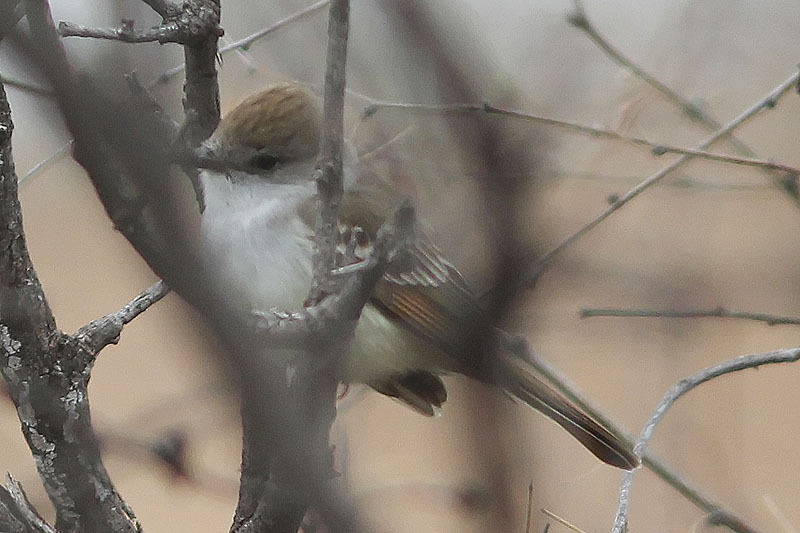 In that same group was a slightly more rare Ash-throated Flycatcher, Myiarchus cinerascens. True to its secretive form, it generally stayed in the middle of the trees, obscured by branches and twigs. However, it stayed around long enough to provide plenty of good views, if slightly obscured and brief. And I say "true to form" based on what the field guides state - this was actually my first Ash-throated. Unfortunately, as I am learning my new camera I accidentally cranked the ISO up to 3200. Apparently that dial that worked one way on my old camera has a different function on my new one! I was able to salvage the photo with some noise reduction, but a bit of the finer feather detail was lost. My Canyon Towhee photos, on the other hand, were not salvageable. 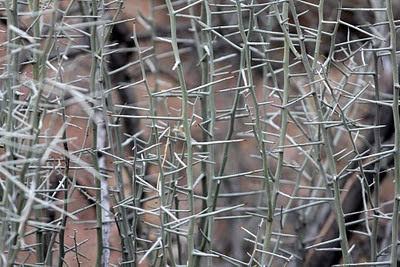 Of course, thorns like that are easy to avoid - they stand out and are readily visible. The tiny thorns of the mesquites and some of the low weeds are much harder to avoid. Speaking of plants, this area was primarily mesquites, ash, and hawthorn. Dave Powell, being a butterfly guru as well, pointed out quite a bit of Seep-willow, a good autumn butterfly magnet. 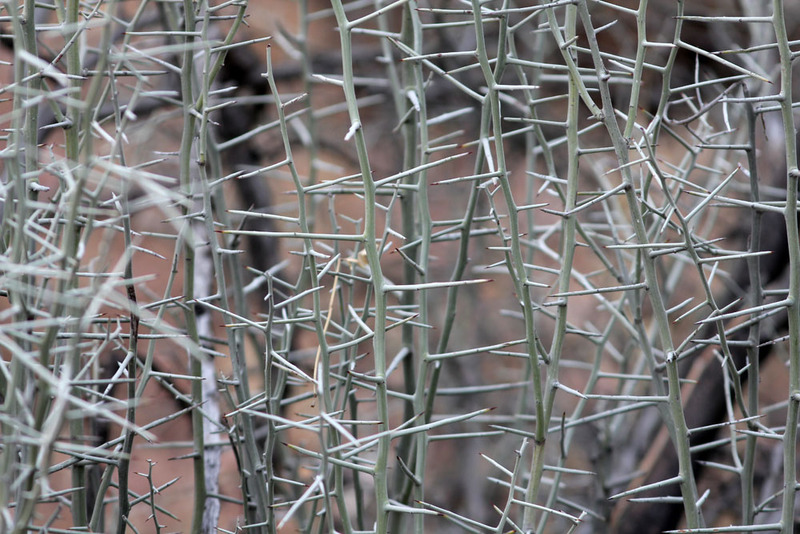 There were also scattered cacti, including Arizona pincussion, barrels, a small number of prickly pears, and chollas. Areas had nice stands of Ocotillos, and there were also a few agaves, and some moderately impressive stands of yuccas - I think we ended up seeing three species. 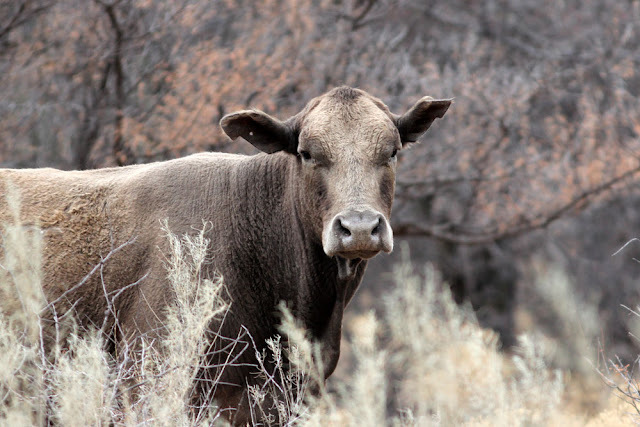 There was some grassland, though much of the area is open for cattle grazing reducing the quality of that habitat. The cattle seemed to keep a close eye on us. Anyway, this area near the cattle was full of berries (hawthorn, I think). And where there are a lot of berries, there are often a lot of birds. This maxim held true, and several mockingbirds and northern cardinals frequented the vicinity. And nearby we were able to draw in a pair of Red-tailed Hawks with some owl calls. Only on inspection of the photo below did I notice that it appeared to have breakfast in its talons. Was this Red-tailed the reason why we came up empty on Montezuma Quail? Click on the photo for the full-size view. 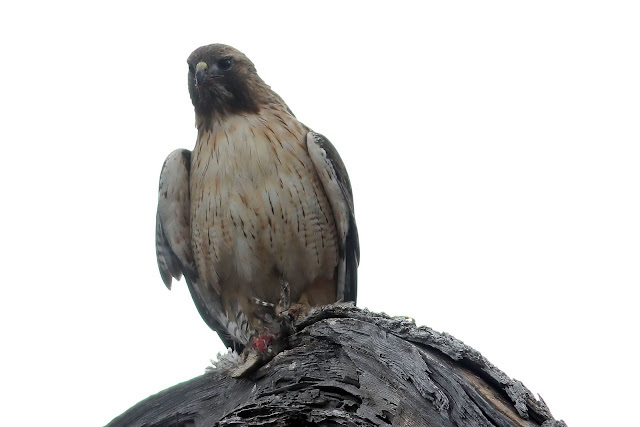 OK, Montezuma Quail are tough even in good years, so I won't solely blame this hawk. We had a good share of Ladder-backed Woodpeckers, a handful of Red-naped Sapsuckers, and a few Northern Flickers (all red-shafted). 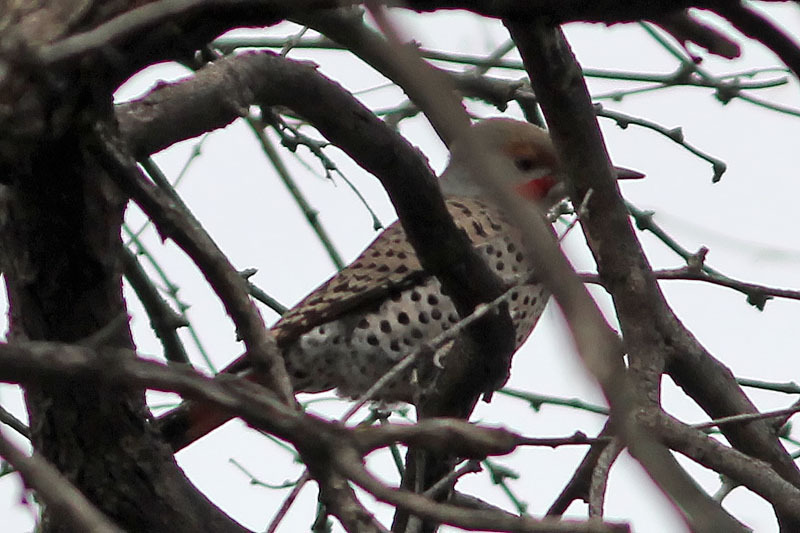 And this Flicker below held true to the pattern for this day of difficult to see birds. 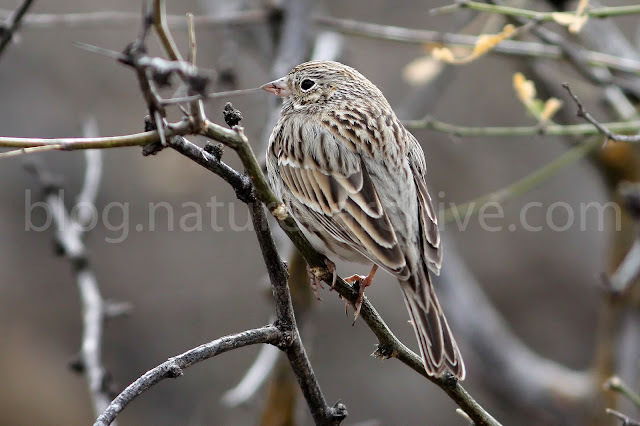 As we proceeded up and out of Jalisco Canyon, we searched a grassland for Cassins Sparrow. No luck, but an Eastern Meadowlark was flushed, seemingly a bit out of place. To this point we'd seen Black-throated, Black-chinned, White-crowned, Chipping, and Rufous-winged sparrows (I actually missed the Rufous-winged, but made up for that later...) And finally we encountered a bird willing that stayed in the open long enough for a decent photo - a nice Vesper Sparrow. As I said before, I missed the Rufous-winged Sparrow earlier in the day, but as we were heading back to the car to end the day, I spotted some movement to the right. 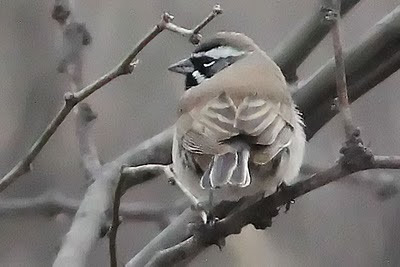 Lucky for me, it turned out to be two more Rufous-winged Sparrows - my second new bird of the day. Drat - sticks in the way again and slightly off focus. Anyway, this photo pretty much summed up the weather for the day...cloudy, stark, and a bit of snow. The habitat seen here was fairly typical of our area up out of the canyons. 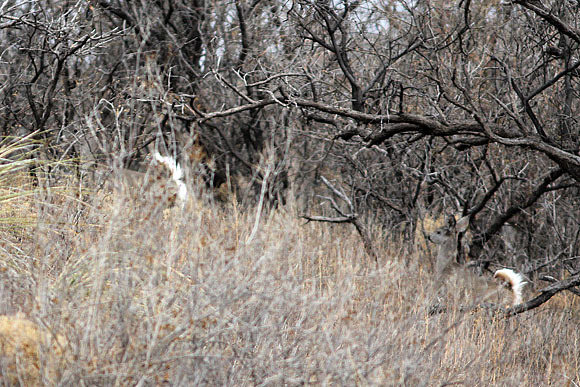 The canyons and there borders often had more dense vegetation and more variety (see the above deer photo). All told, we ended up with 30 species of birds in about 7.5 hours of work. Definitely not the most diverse or productive area, but it was a great experience and a lot of fun! Great informative post. I've explored the area for Buprestids. I'd like to participate in the next CBC but not quite sure my old knees can handle 7 hours of hiking. Kudos and best wishes, ... D.
Thanks for the comment. I just checked out your blog - nice! I'd love to know more about what species of Buprestids are found in SE Arizona - any recommendations on field guides or other resources?